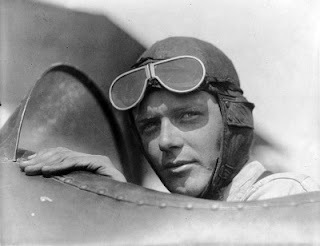 I ran across an article in a 1929 trade magazine that described the young Robert Montgomery as being a spitting image of Charles Lindbergh. I thought, "Really?" Okay, they were both tall and quite slim in their youth, but... 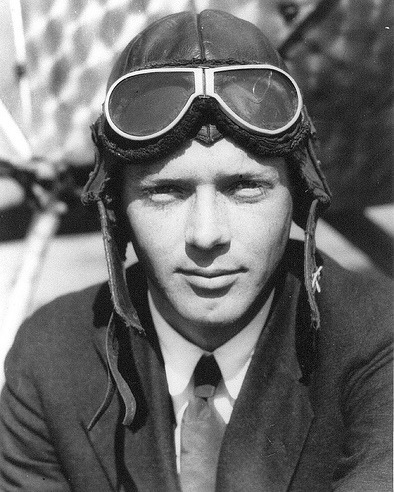 Anyway, I dug out a few photos of the young Lindbergh to compare them with Bob. Well, darn it, I think they were right after all. 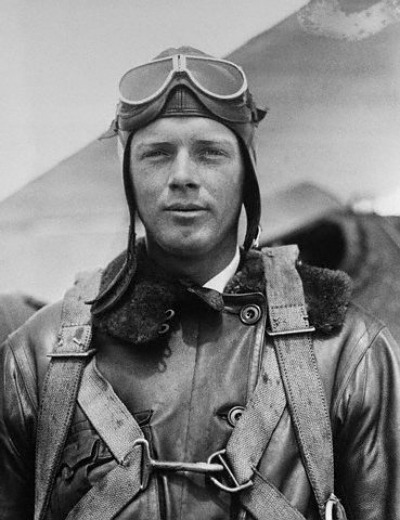 Quick ... which of the following seven photos are Bob and which are Lindbergh? 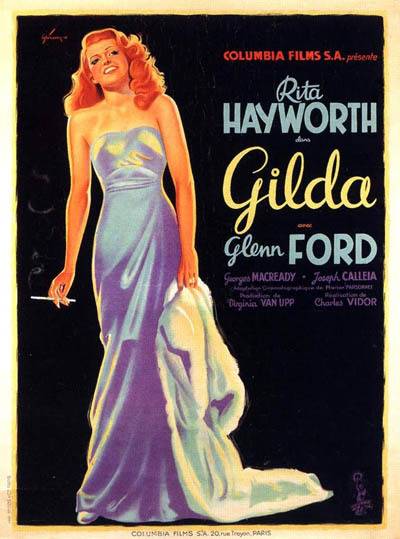 For you history buffs out there, check out CONELRAD's in-depth article on the hunt to prove Rita Hayworth's image was on the fourth Atomic bomb tested. Interesting story! I bought a copy of the July 1, 1933 edition of Picturegoer for its pictorial spread on Hell Below. It is quite good, but I really enjoyed finding the picture above. 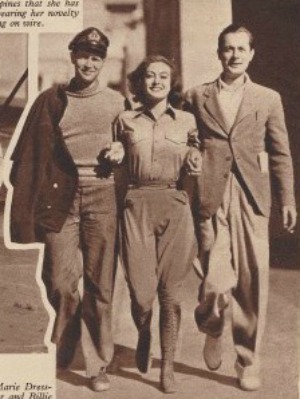 Franchot, Joan and Bob strolling merrily along on the MGM lot ... love those "candid" shots. Note: Bob is wearing his white bucks but no ascot. Ascots were perhaps too formal in a work situation? 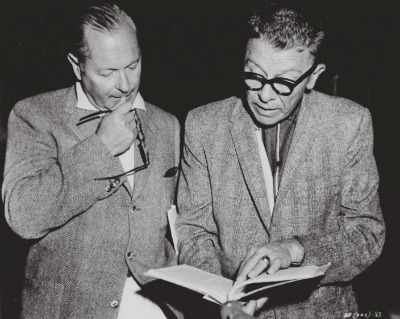 And, in some forgotten magazine, I ran across the photo below of Messrs. Cagney and Montgomery on the set of The Gallant Hours. One just cannot have too many pictures of Jimmy and Bob. 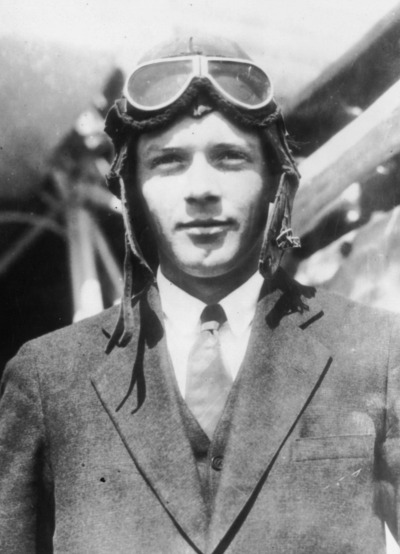 The man just knew how to dress well. 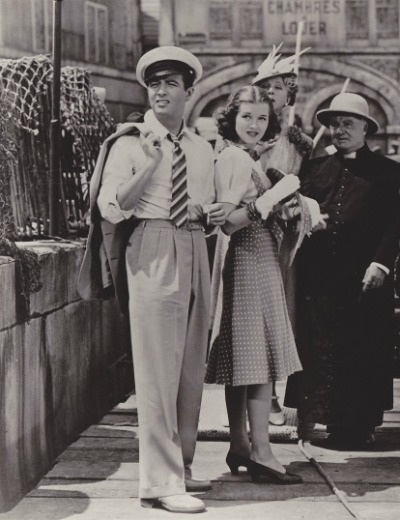 Men's casual wear of the 1930s was gorgeous ... errr ... the casual wear of the upper class, I mean, not the clothing worn by the men waiting in line for free soup. And Bob knew how to put it all together: the paisley ascot, the perfectly tailored sport coat and pants, and white bucks, of course. Notice how the pant cuffs just hit the top of the shoes. No breaking of the pants crease for Bob. 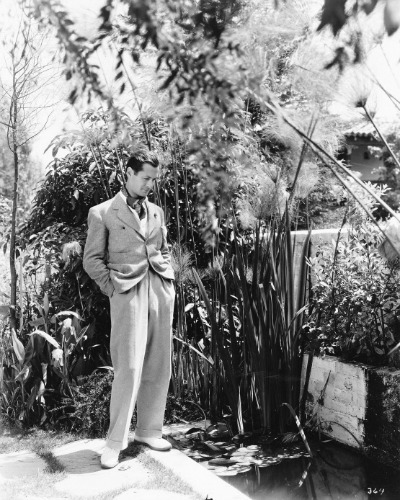 The photo above is one of a whole series of shots taken both in and outside of the Beverly Hills home he purchased in 1932. It's referred to as a colonial bungalow type home. Nice, I'm sure, but not quite the mansion he builds later. Bob did not have to stand in any food lines. What I like about the photo below is that the photos on the wall were taken by Hurrell. Original Hurrells. 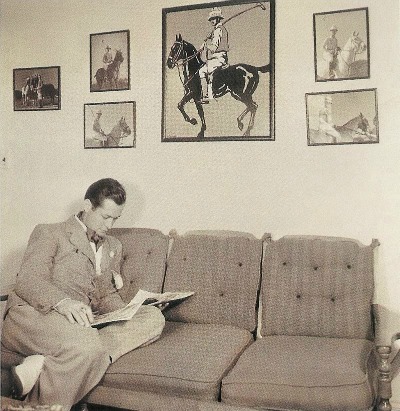 And he has them on his wall because they are pictures of his polo ponies, Hurrell was just the photographer at the studio doing Bob a favor. Wonder what happened to them. He may not have the muscular body of a boxer, but that look of determination ... watch out! 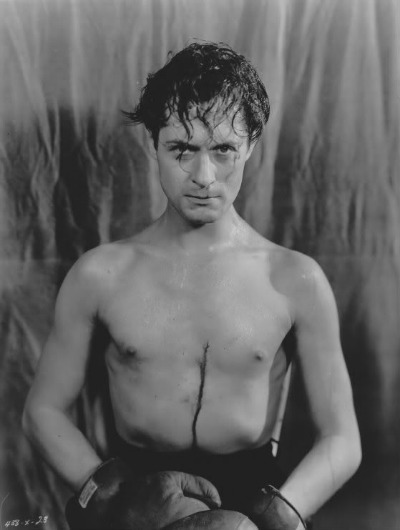 By the way, the mark on his chest is supposed to be blood from the cut on the left side of his face. The first time I saw the photo, I thought it to be one nasty scar. He will later in life obtain a couple scars from operations - appendectomy, gall bladder - but the bod is untouched at this stage ... surgically, I mean. Fred Clark is being arrested, Bob has been shot and, saddest of all, one really bad hair day for Wanda Hendrix. 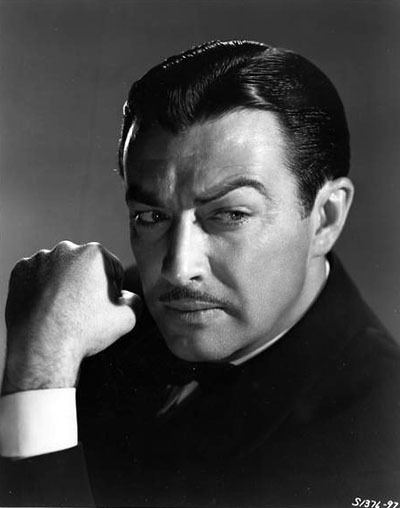 Did We All Forget John Hodiak? Last week, I was flipping through the DVR listings for TCM, picking out stuff to watch. 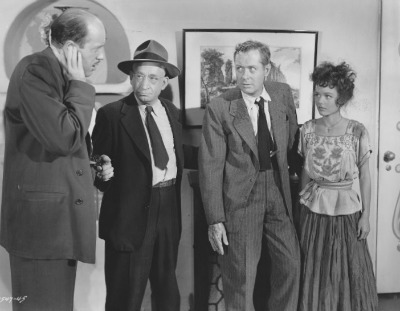 I came across Maisie Goes to Reno (1944), said what the heck, and hit the record button. I finally sat down last night to watch a movie all the way through and picked out Maisie. 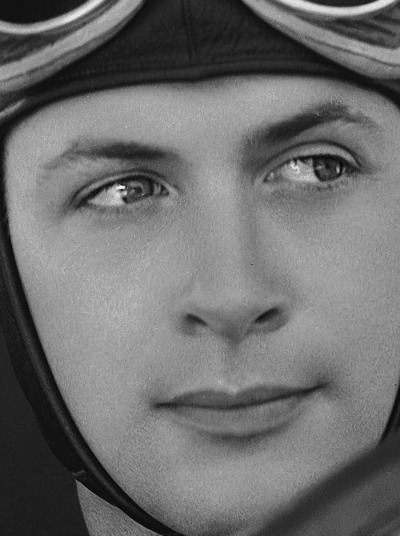 Lessee, last time I watched a Maisie movie, she was in love with Robert Young's character. 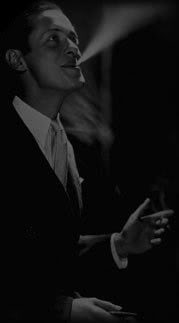 Last night, she fell in love with Flip - John Hodiak. How Masie goes from guy to guy in each movie is another blog topic, but Hodiak kinda caught my eye. I thought he was strictly 1950s. Then I Googled him (yes, it did tickle). Looking at his filmography, I realized I had probably seen him in five different movies over the past two months. Add to that, his shortened career due to a heart attack, has really made it difficult to find any information on him. At least one blog out there has a good writeup. But really what got me was sitting at my desk to write this post. I realized I have a photo of him here staring right at me. So everyone reading here has some homework. Go watch a John Hodiak movie or two and remember him. Better yet, drop a line here and let us know the flick - I'm curious now. 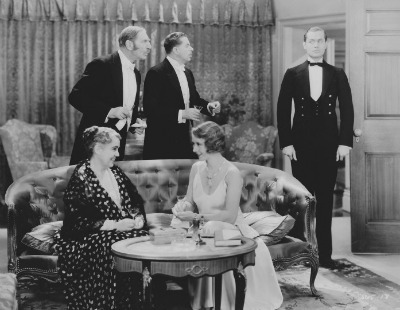 The Man in Possession (1931) with Beryl Mercer, C. Aubrey Smith, Reginald Owen, Irene Purcell and Bob. Irene Purcell, Bob's co-star in the delightful pre-code romp The Man in Possession, was born on August 7, 1896 --- or 1901 per the engraving on the Johnson family crypt. (Like she was the only person in Hollywood who shaved a few years off her birth date...) Irene came to Hollywood from the stage to make a half dozen features in 1931 and 1932, and then left the movies, to go back to the stage, I'm assuming. There just is not much information on Irene out there. I did discover that in 1941 she married Herbert Fisk Johnson, Jr., the third generation Johnson to run the Johnson Wax Co. With the marriage, she moved into Herbert's home outside Racine, Wisconsin. 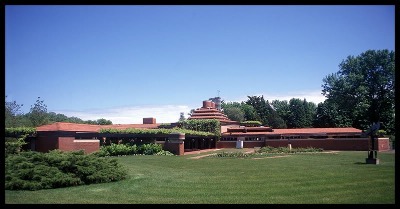 Wingspread, as it was named, was designed by Frank Lloyd Wright and constructed in 1937-1938. Coming in at a mere 14,000 sq. ft., there were four wings (private wing, children's wing, guest rooms and servant quarters) that extended from a massive multi-storied open area used for communal functions such as dining and entertaining. 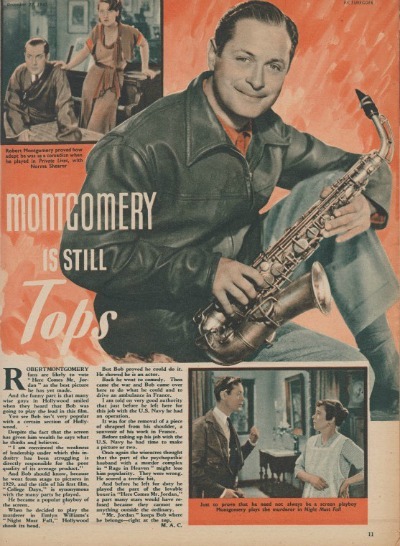 In the 1950s, the Johnson Wax Co. would become a principal sponsor of Robert Montgomery Presents. Do you think there were jokes on the set about Bob sleeping with the Boss's wife? 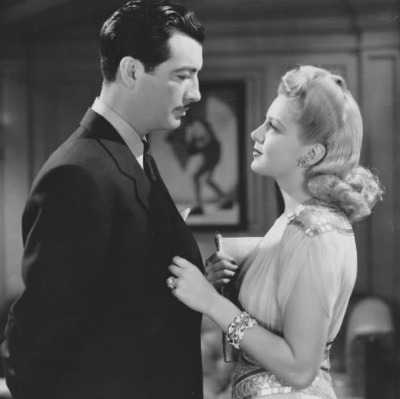 You had to be one good-looking lady to share the screen on equal grounds with Robert. I'm a collector of all things Bob --- big surprise, I'm sure. 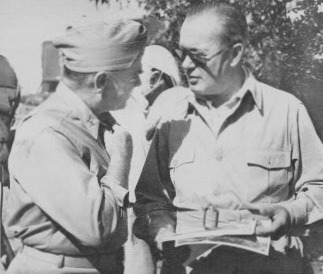 Since there's usually not much information provided about photos I have obtained, I spend a lot of time trying to find out everything I can about them. It's usually fun for me, especially when I have an "Eureka" moment. For example, a new photo may provide an answer to questions I have re another photo ... who the photographer was, when it was taken, where, etc. I would prefer finding out more about Bob as a person; but, well, that's a rather overwhelming task at this point in time. I'm left with trying to find out the public minutiae of his life. Sigh. Anyway, I purchased the photo below not too long ago. No information provided, of course. 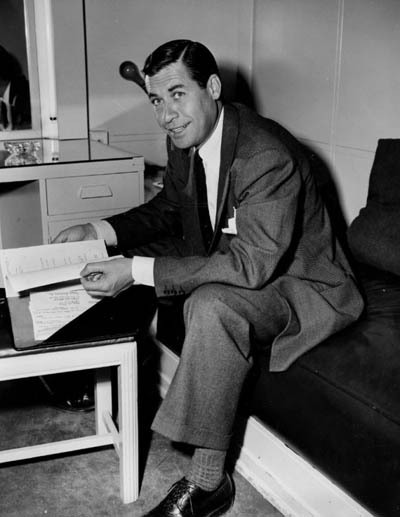 I know it was taken, along with numerous others, in May, 1959, as a promotional shot for The Gallant Hours. 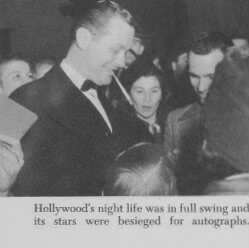 They did one day of shooting candids, several of both the Montgomery and Cagney families visiting the set. Bob is wearing the sport coat and white slacks outfit he wore that day. I'm sure he thought he was being very casual. So, I know when it was taken, where and why, but ... who is the other gent? 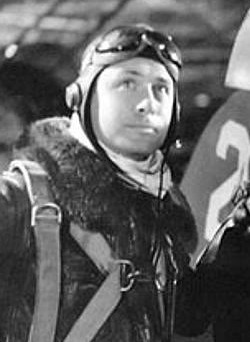 I've gone through the principal crew members of the movie, but could not find a match, or at least not an obvious one. 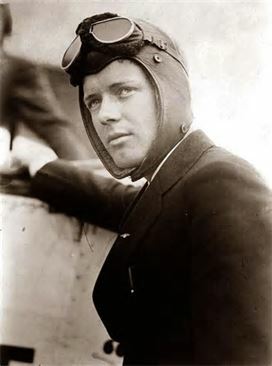 Do you know who he is?